The Google Earth kmz file hyperlinked ten times in this article is a comprehensive, though not exhaustive spatial model of Nephite cities, lands and places in the Book of Mormon. You must have Google Earth (available here free of charge for PC, Mac or Linux) installed on your computer to open this file. All of the static images in the article "Book of Mormon Map" and most of the images on this blog came from this model. The image below represents only a small fraction of the data in the model. As with all images on this blog, click to enlarge. then this correlation can be empirically demonstrated 100% using the powerful data sets & tools available in Google Earth. In other words, this model works. It fits the text precisely and consistently. Antecedents. In 1976, M. Wells Jakeman taught his "Archaeology of the Book of Mormon" class for the final time at BYU prior to his retirement. I was fortunate to be in that class where all students were required to draw a Book of Mormon map. Mine was crude, mirroring my knowledge of the Book of Mormon text and Mesoamerica at the time, but I still have it. As I internalized some of Jakeman's passion for the Nephite scripture, I sensed that I would return to this endeavor at some future date when I was prepared to make a contribution. So, to Professor Jakeman (who passed away in 1998) I am pleased to report that after 36 years I have finally created a Book of Mormon map that bears scrutiny. In 1979, John L. Sorenson and I met John W. Welch for the first time. After Welch moved to Provo the following year, the three of us were the early directors of the Foundation for Ancient Research and Mormon Studies (FARMS). I was privileged to help Sorenson in small ways with the publication of his watershed An Ancient American Setting for the Book of Mormon Salt Lake City: Deseret Book & FARMS, 1985. We spent many hours working with the cartographers at the University of Utah who prepared the splendid maps for that seminal publication. I have never been able to square John's geography model with my reading of the text, but my intellectual debt to him is incalculable. I was the second reviewer on Amazon and the first reviewer on Deseret Book when his eagerly awaited magnum opus, Mormon's Codex: An Ancient American Book appeared in September, 2013. In 2006, V. Garth Norman and I spent two weeks in central and southern Mexico. We had been on Mesoamerican expeditions together before, but this time Garth convinced me that his correlation of the narrow strip of wilderness was pivotal to an accurate understanding of Book of Mormon spatial relationships. I helped fund the initial publication of his "Book of Mormon - Mesoamerican Historic Geography Study Map" and several thousand copies of that important work are now in circulation among Book of Mormon students worldwide. About 80% of my Google Earth Book of Mormon Model is based on Garth's map. My work is essentially a refinement of the "Mormon-Norman" correlation. For the last several years, I have been an enthusiastic participant in the annual Book of Mormon Archaeological Forum (BMAF) "Lands of the Book of Mormon" Conference. This has given me the chance to rub shoulders with devoted Book of Mormon students such as Joseph L. & Blake J. Allen, Joe V. Andersen, Stephen L. Carr, Douglas K. Christensen, F. Richard Hauck, Lawrence L. Poulsen and Ted D. Stoddard. The Allens helped me sort out the Nephite east coast. Hauck & Andersen pioneered the correlation I now accept on the west coast. Larry Poulsen introduced me to the power of Google Earth. Ted Stoddard motivated me to commit my ideas to writing. And Steve Carr & Doug Christensen have helped me refine my presentation as we have collaborated on occasional conference calls. The Text. I have made the bold assertion that this model fits the Book of Mormon text with no discrepancies. My interpretation of the text assumes we can take the Elizabethan 'King James' English that fell from the Prophet Joseph's lips at face value a la 2 Nephi 25:7 & Alma 13:23. See the article "Plainness." But, which version of the text? Royal Skousen's The Book of Mormon: The Earliest Text New Haven: Yale University Press, 2009. Commonly called "The Book of Mormon Critical Text," Skousen's edition is essential for any serious Book of Mormon student who ferrets meaning from passages by carefully considering each word in context. See the article "Scribal Error" in this blog for examples of problems in the 1981 LDS text germane to any discussion of Book of Mormon New World geographical correlations. See the article "Bountiful - The Text" in this blog for examples of Royal Skousen's critical text emendations superimposed on the 1981 LDS text, highlighting the variant readings. The Book of Mormon was published in 1830. That was 183 years ago. Why has it taken us this long to produce an empirically verifiable Book of Mormon map? Part of the answer: We didn't have a widely accessible de facto standard text until the Yale University Press edition came out in 2009. The Technology. The Book of Mormon text is often ambiguous. Therefore, solving the geography puzzle is a complex, multi-variate problem requiring best fit analysis across several hundred data points. That was dauntingly difficult before the advent of user-friendly Geographic Information System (GIS) software such as Google Earth. In August, 2011 when I began to write about this research odyssey, it was obvious that decades of wrangling over sub-disciplines of anthropology and paper maps had not and likely would not ever produce breakthrough results. We were arguing over which river was the Sidon in the 1970's and in 2011 we were still arguing. We were comparing a highly reliable source (the text) with subjective, evolving sources (the shifting sands of anthropological opinion). So, I posed a simple question: What if I compared one highly reliable source (the text) with other highly reliable sources (elevation, directionality, distance, topography, hydrology, population density, forest cover, etc.)? We might quibble now and again about textual exegesis, but it would be hard to discredit satellite imagery from NASA and ESA. Results. Focusing first on the river Sidon, in about a month the question was settled to my satisfaction. The Usumacinta is a decisively better fit to the text than the Grijalva. See the blog article "Water Fight on the River - Round Nine." 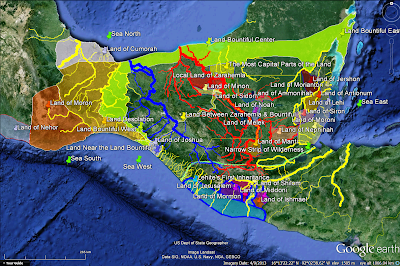 Analyzing individual Nephite polities convinced me this Google Earth-based topographical approach facilites robust micro geographies that are capable of enriching our understanding of the text. See the blog articles "Ammonihah," "Gideon," "Hermounts," "Manti," "Melek," "Minon," "Sidom," "The Narrow Pass and Narrow Passage," "The Narrow (Small) Neck of Land," and "The Narrow Strip of Wilderness." As the model came together in a way that many found clear and convincing (see the blog article "The Usumacinta/Sidon Correlation") I ventured to analyze the life and times of one iconic Book of Mormon hero whose detailed narrative accounts for about ten percent of the entire text. See the article "Captain Moroni in Space and Time" in this blog. The feedback was encouraging. Many, such as my friend Larry Stay (formerly Guatemala City South Mission President), said they were excited to now understand the war chapters in Alma more logically and vividly than ever before. I posted a few teasers to test the feasibility of kmz file publication on Google infrastructure. See the article "Google Earth Downloads" in this blog. About a month later I had a version of the comprehensive Book of Mormon Model that I deemed worthy of publication. Note: all 9 of the Google Earth kmz files available individually on the "Google Earth Downloads" blog article are included in the much larger Book of Mormon Model. When you download the 14 MB Book of Mormon Model you get the latest version of everything packaged in a single kmz file. Breakthrough Insights. A handful of key relationships enabled the success of this model. 1) Ammonihah, Noah & Sidom were all east, not west of Sidon. See the blog articles "Ammonihah," "The Usumacinta/Sidon Correlation," and "Ammonihah Noah & Sidom all East of Sidon" for extended treatments of this important paradigm shift. 2) The narrow neck really was narrow, straddling the east-west Bountiful-Desolation border. See the articles "Captain Moroni in Space and Time," "Sidon East then West," "The Narrow Pass and Narrow Passage" and "The Narrow (Small) Neck of Land" in this blog for maps showing a number of correlations, including the narrow neck, clustered along the west coast. 3) Nephite settlement followed the rivers. See the blog articles "Expansion of the Nephite Nation" and "Sidon East then West" to visualize the Nephite republic's orderly, intuitive growth patterns. 4) If a place had a wilderness side, that topographic feature is distinguishable in modern geo-coded satellite imagery. See the blog articles "Ammonihah," "Manti" and "Melek" for salient examples. 5) The Nephites did not control all of the territory in the land southward north of the narrow strip of wilderness. Large areas such as the Mirador Basin in northern Peten were never part of the Nephite republic. See the article "Bountiful - Context" for a discussion of Nephite co-existence with their powerful neighbors. The article "Plainness" discusses the Nephites' non-exclusive territoriality. 6) One day's travel was a standard unit of measure in Nephite culture. See the blog article "Land Southward Travel Times" for a data-driven derivation of this fundamental metric. 7) The term "Zarahemla" referring to a land has three distinct geographic meanings in the text: a) the local land of Zarahemla west of Sidon, b) the greater land of Zarahemla contiguous with and exclusive of the land Bountiful, and c) the continental land of Zarahemla inclusive of Bountiful, contiguous with the greater land of Nephi, and together with Nephi constituting the entire land southward. See the blog article "Zarahemla." Other lands with multiple geographic meanings include Bountiful, Desolation, Lehi and Nephi. The term "Lehi" is applied a single time to the entire land southward, in parallel with the term "Mulek" applied to the entire land northward Helaman 6:10. Most other references to "land" in the text refer to local lands or personal land holdings. "Lehi-Nephi" was a politically correct term used only in the first few years of the reign of King Zeniff. Before and after that brief window in time, the Nephite term was simply "Nephi." Caveats. While I consider the current Book of Mormon Model a significant milestone in the history of Book of Mormon studies, it is still rough in a number of spots and far from finished. Lamanite lands in the greater land of Nephi have been analyzed with less rigor than Nephite lands north of the narrow strip of wilderness. Jaredite lands have been examined only superficially. Nephite toponyms with limited contextual referents (Angola, Boaz, David, etc.) are tentative. Textual references hyperlinked to the online 2013 text hosted on lds.org are not yet consistently applied. Interested students will understand the model in greater depth if they will read the articles posted on this blog, only some of which are currently hyperlinked in the model itself. Many more external corroborations, movements, battlefields, etc. need to be looked at. Nevertheless, this work is substantial. It represents many thousands of hours of effort and is almost certainly the most sophisticated and empirically rigorous attempt to date to correlate the Book of Mormon text with a real world location. Prospectus. I expect this work will eventually lead to an illustrated Book of Mormon atlas done with enough rigor that lay readers of the Nephite text worldwide will benefit. Note: "Yea as an Indicator of Further Explication" in Royal Skousen, "The Systematic Text of the Book of Mormon" in Journal of Book of Mormon Studies Volume 11, Issue 2, Provo: Maxwell Institute, 2002.